Our little 4 year old announced yesterday, “Our whole entire family forgot what warm weather feels like!” as we enjoyed spending some time outside in the early spring like weather. We do feel like we’ve been cooped up in the house for a long, cold winter. We are still having lots of cool weather and not enough sunshine, but it is working towards that direction. I started planting the spring garden. 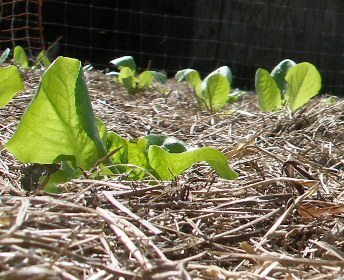 I’ve planted romaine lettuce, butter crunch lettuce, pak choi cabbage and stonehead cabbage. I also planted some onion sets. I have several seed trays filled with more veggies that will be planted as soon as they are big enough to be transplanted. One of my gardening goals this year is to keep track of what I spend on seeds and plants and compare that to what the garden produces. I’ve been writing on Penny Pantry, my pantry building blog, about ways to save money on the grocery bill while building a huge pantry. I’m planning on covering a lot about saving money on your grocery bill with gardening. Gardening is a powerful tool that a homemaker can use to drastically save money on the grocery bill. Not only does gardening save money, but home grown food is much healthier. Home grown food also tastes much better. Here are some of our baby lettuce plants growing in our garden. I bought these from an Amish lady who sells vegetable starter plants. I have spinach and black seeded simpson lettuce growing in the starter trays from the .20 cent seed packages I purchased. I’m planning on planting those in several weeks. By that time, we should be eating off these lettuce plants. I’m with you on how much joy gardening brings into our lives…. I love gardening! Yea…. doubled the size of your garden plot! That’s so great! Best wishes to you on a very productive garden this year!